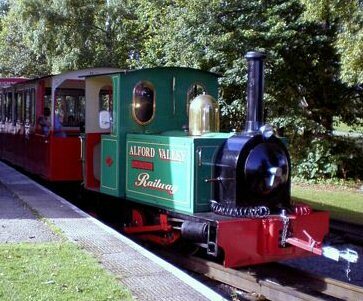 Alford Valley Railway in Aberdeenshire is a two foot narrow gauge railway run by volunteers taking passengers on a return trip from the Alford Railway Station to the picturesque Haughton Park. The trains are changed in accordance to the seasons. So in the summer passengers can take a trip on the colourful one pictured above whilst during the run up to Xmas they run the Santa Train. Other seasonal trips include the Easter and the ghost one at Halloween. Each year, usually in the first two weekends in December, it operates a special 30 minute ride to take children to meet Father Christmas on the Friday, Saturday and Sunday. During the Santa Train trip, the festivities begin with carol singing and song sheets are helpfully provided by the volunteers. The service includes a trip through the Golf Course to Haughton Park and then it returns to Alford Station where tea, coffee and squash is available along with some delicious mince pies, shortbread, biscuits and Christmas pudding. Then the children are taken through by Santa's little helper to meet Father Christmas in the Station Waiting Room. Each child is able to talk to him and receive a present. They leave every 35 to 40 minutes from 10am with the last departing at 3.30pm. The musical organ plays a range of warming tunes to help pass the time. More entertainment is provided by the guards and the clown. Toilets can be found on the platform, none are on the carriages. 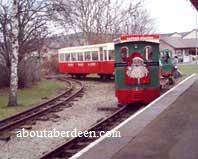 The cost of the Alford Santa Train is �4 for each adult and �5 for each child, which includes a gift for the children. Nurseries, Playgroups, Schools or Party Groups can book their departure time for the fridays only. Early booking is recommended to avoid disappointment. No bookings can be made on the Saturdays or Sundays but exceptions may be made if you have a large group or require special needs. The Alford Valley Railway Santa Specials are fantastic seasonal value offering a magical experience for all the family and especially the children. The cost of tickets includes music on and off the train and gift stalls. This Aberdeenshire Santa Specials have been running successfully for several years thanks to the local volunteers. These include individual volunteers, Guides, Scouts who give up their free time and work hard to make this Christmas event, the highlight of the year. The AVR Company is extremely grateful for their continued help, but more importantly, it is grateful for your support. The line and station was opened in 1859 and closed in 1965 after the Beeching Report. It served as a link to Aberdeen and Inverness. In 1979, a group of enthusiasts created the narrow-gauge railway using salvaged 2' track, wagons and locomotives from New Pitsligo village. It was opened in 1980 and more wagons and locomotives have been acquired over the years. They usually operate between May to September, with the special Santa and Easter trains running as special events. To get there from Aberdeen take the A944. If you pull into the lay-by as you enter the village, you can see the Aberdeen Angus Statue. Continue through and be prepared to take a right turn - it is sign posted. The car park can be found on the left and the entrance is straight ahead. 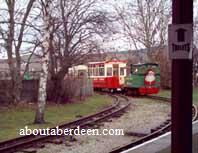 After your visit you can take a short walk to the left to go to the Grampian Transport Museum. More places to take the children. At Halloween time the team run a ghost train for children and their families. The ghost train departs from the Railway Station and passengers are told scary stories from the volunteers. The lights are switched off and since the track goes through fields it is atmospherically dark and things get really spooky when the sound effects are switched on! Those running it dress in Halloween costumes such as wizards, witches, ghosts and skeletons. Once it returns children can play Halloween games such as apple dooking and taking part in colouring competitions.